Home » The Self » What is Self-Reliance and How to Develop It? Self-reliance is all that it sounds like plus considerably more. If not introduced to the world by Ralph Waldo Emerson, it was definitely brought to much popular public awareness by his 1841 essay Self-Reliance. In positive psychology, self-reliance has strong theoretical significance thanks to its implications for happiness. You’ll probably notice some overlap, or at least potential implications for self-worth, self-expression, self-knowledge, resilience, and for self-acceptance. So, it’s not about doing everything yourself. It’s not about being financially independent, either. And it’s certainly not about shouldering every hardship you face all on your lonesome. 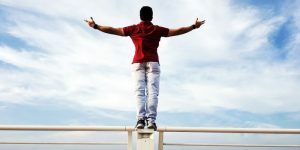 In this article, we’ll have a look at what being self-reliant really refers to, and how we can develop it within ourselves. What is the Meaning of Self-Reliance? Interestingly, there’s no single sentence—not even from Emerson himself—that really captures all the aspects of self-reliance in one pop. Merriam Webster defines self-reliance simply as ‘reliance on one’s own efforts and abilities’, which doesn’t quite do the concept much justice, either. Let’s look at the psychological mentions of self-reliance for a better understanding. In an age where statistics allows almost everything to be psychometrically measured and operational definitions abound, it isn’t surprising that there’s no one definition for self-reliance. What we do know is that the concept has been linked to ‘the self’—in its psychological sense—for at least several decades (Baumeister, 1987). “a reliance on internal resources to provide life with coherence (meaning) and fulfillment” (Baumeister, 1987: 171). As mentioned, Self-Reliance is the topic (and title) of an 1841 essay from US philosopher Ralph Waldo Emerson. Born in Boston in 1803, Emerson wrote poetry and gave lectures that would greatly influence other famous names such as Henry Thoreau and Walt Whitman (IEP, 2019). Self-Reliance contains Emerson’s beliefs and perspectives on how society negatively impacts our growth. He argues strongly that self-reliance, self-trust, and individualism, amongst other things, are ways that we can avoid the conformity imposed upon us. Or, he also argues, that we quite frequently impose upon ourselves. It’s a powerful piece of work, and although I’ll try to isolate the most heavily emphasized aspects, it is definitely worth reading in its entirety. If you’d rather listen, there’s also a link to the free audiobook at the end of this article. Many things can be construed from Emerson’s writings. Here are a few examples of some key concepts that shine through in his seminal essay, Self-Reliance. The ability to think autonomously goes hand in hand with trusting your own instinct. Lots of Emerson’s work centered on how people tend to ‘hide behind’ what they’ve learned from society, or significant others within society. He believed this was mere imitation and was linked with a lack of confidence in one’s own intuition and rational capabilities. Basically, if you (or I, or anyone) believe in something, and consider that it holds merit after thinking it through, there should be nothing holding us back from voicing it with confidence. Not to do so, Emerson believed, is to conform to societal expectations for no good reason. As a more practical example, we can imagine that Bella has parents who are both lawyers. They want nothing more than for Bella to follow in their footsteps and are encouraged by her excellent grades at school. At home, however, Bella finds that she’s spending every spare minute writing poetry. She wants to make a difference to the world and touch people’s lives through verse. This is where she finds her greatest happiness and decides instead to pursue a career as a poet instead. In an extension of the above, Bella seeks to take steps toward achieving her own goals of becoming a poet. She’s aware that she’ll receive a lot more emotional and financial support by following her parents’ dreams, but she’s willing to take her chances. Because Bella believes in ‘cause and effect’ (Emerson, 1967), and that purposeful action will get her there. She isn’t overly concerned about rejection by her parents, because she just wants to be herself. These three examples are based on the key arguments in Emerson’s original paper on self-reliance, and represent the three concepts most closely related to individualism. It’s important to remember that self-reliance is not about cutting yourself off from everybody. That is, being true to yourself, being capable of independent thought, knowing your own loves and being able to pursue them independently of others’ judgments is not the same as isolating yourself from society. While Emerson does expand considerably on the value of solitude, the idea of social networks—of having friends—features strongly in his work. We’ll touch on these shortly when we look at how to develop self-reliance. Having self-reliance is important for several reasons. The most obvious being that depending on others for help, means there will be times when it’s not available. Of course, the list is very far from exhaustive. If you have personally experienced, or believe other important benefits from becoming self-reliant, please do share them. Whether you want to develop self-reliance yourself, or you’d like to help your child on their own journey of development, here are some tips. In an article on developing self-reliance, mental health counselor Mandy Kloppers offers several practical steps. 1. Accepting yourself, and being your own best friend. Learning and appreciating your own character strengths is very important in being able to support yourself as you go through life. What are your character strengths? Are you kind? Curious? Brave? Don’t forget to reflect on your achievements and the things you accomplish that make you feel proud. It’s important not to put yourself down or sabotage your own efforts. In society, we’re conditioned to feel happy when we receive compliments, praise, and reassurance from others. If that’s not forthcoming, we can feel insecure or vulnerable, sometimes even helpless. Being self-reliant involves the ability to feel confident in yourself when these aren’t around—because they may not always be. Not sure what to be confident about? Try one of these activities to increase your sense of self-worth. 3. Making our own decisions. Kloppers advises against looking consistently outside for security and relying on others to accept us for who we are. When we can accept ourselves as unique and practice non-judgment, we can find security from inner sources. This rational, independent thinking is something we’ve already touched on. As children, we learn to look to others for guidance when solving problems or making decisions. The tendency becomes ingrained within us, and as adults, we aren’t always capable of handling adversity in a way that we feel sure about. Have confidence in your own capabilities and it becomes a lot easier to find security within. 4. Recognize and manage dependence. Becoming aware of when you tend to turn to others is a part of self-knowledge. We may know that we turn to others for certain things, but sometimes this means we’re missing out on a chance to build up our own confidence. Setting goals and achieving them your own way not only gives you a sense of accomplishment and reward but greater belief in your own judgment. 5. Accept yourself for who you are. Self-acceptance is a huge thing. Instead of looking to others for approval, it’s alright to give that approval yourself. Seeking others’ acceptance is yet another way that we practice dependence on others, and it can be a pervasive, hard-to-shake habit. To develop self-reliance, we need to notice these tendencies before we can change them. But it’s worth it. You can read Kloppers’ article in its original post. 1. Having your own values. Society’s values may not be aligned with our own deep-rooted beliefs. This can be at such a subconscious level that we don’t always pick up on it. If society values one thing, and it’s not congruent with our own, we can feel as though it’s hard to gain acceptance. For example, you may value diversity and inclusiveness but maybe work somewhere that doesn’t also value such a culture. This creates cognitive dissonance that can be unpleasant to deal with (Fostinger, 1957). 2. Not relying on ‘things’ to feel happiness. Emerson also argued strongly about the negative potential influences of material possessions; he was of the belief that we live in materialistic times. Life is constantly changing if we tie our happiness to external objects, what happens when they’re gone? 3. Decide who you want to be, and how you want to get there. Pretty much, this is almost the same as having your own values. Except that once we know our own values, we can understand what makes us happy and how we would like to live our lives. Then, we exercise our own judgment about how we want to get there. Arguably, these aren’t the only ways we can develop self-reliance. It’s also true that children will often need much simpler approaches to learning that can often start at a more practical level. Learning to tie one’s own shoelaces, take on little jobs, and so forth. Self-reliance begins at an early age; at least, some basic elements of it definitely do. Others aspects of self-concept take a little more time to really develop—such as learning to view ourselves as independent and challenging others’ perspectives. 1. Solving Problems Themselves – Of course, these will be problems that can reasonably be considered within the cognitive and physical capabilities of K1 and K2 kids. Teachers and parents can offer preschoolers support and help during the process while allowing them the freedom to trial-and-error and exercise discretion (Vygotsky, 1978). 2. Making Their Own Rules For Play – As kids play, there are times when teachers can step back and let them establish their own rules for games and make-believe. Through this, they can develop their own boundaries (NIDirect.gov.uk, 2019). 3. Scheduling Routine Tasks – Tomlin suggests parents and educators start small and work their way up gradually. That is, an adult can make the child a timetable for chores that they are expected to complete. Kids can check these off as they complete them or put a star beside the task. Over time, these chores will adapt to suit a kids level of development, but they can start simple, like feeding a pet or cleaning their play area. 4. Managing Their Time – This builds on the previous skill. As they grow, kids can learn to start doing the timetabling for themselves. A nice exercise for this is included in the next section on Self-Reliance Activities for Youth. 5. Developing Independent Thought – Giving kids options allows them to think and choose for themselves. This is the first step toward independent thought at a much higher level later on. 6. Making Friends – Emerson described the joy of friendship as (1967): “the spiritual inspiration that comes…when you discover that someone else believes in you and is willing to trust you with a friendship”. As kids make friends, they learn to build up positive images of themselves while expressing care and empathy for their peers. 7. Completing What They Begin – When the initial fun wears off, the temptation to just walk away from an activity is pretty familiar to most of us. This is despite the fact that perseverance can often lead to incredibly rewarding and intrinsically motivating results. Teaching kids to complete small tasks that they get started on is a good way to help them develop self-knowledge, self-discipline, and pursue larger goals (Locke & Latham, 1990). 8. Tidying Up After Themselves – Such a basic self-reliance skill that most of us probably can’t recall when or where we learned it the first time around. For preschoolers, it provides a sense of stability and predictability—but more importantly, a means for achieving it. This can be valuable for dealing with turmoil or adversity in more serious scenarios. 9. Asking for help – In order to learn, and to eventually make rational, individual decisions, kids shouldn’t be afraid to reach out for help when they need it. Being comfortable with yourself, as Emerson argued, is a key part of being self-reliant (Emerson, 1967). Even if that means asking others for guidance or clarification (Warburton, 2016). 5. Practical Skills – Here, Taylor describes activities in everyday life, just like the chores suggested by Tomlin above. For preschoolers, this could mean tidying up their toys, feeding a pet, or similar. In this next part, some more specific activities and PDFs that will hopefully give a better sense of how both preschoolers and older kids can develop self-reliance. If you’re a teacher, parent, or are involved in youth work, here are three activities (as PDFs) that you can easily download and use as resources. There are a few different elements of self-reliance within these, including simple practical tasks that younger ones can easily get a hold of. This one’s a group activity that’s best suited for younger children of about KS1 or KS2. The underpinning theory of this exercise is that kids can develop a sense of their own competence by learning to identify their own strengths as a person. These can include unique capabilities, talents, and characteristics—once kids become aware of these, they can tune into these positive aspects in difficult situations. You will need some large pieces of paper, drawing materials, and some space for the group. Start by inviting the kids to think of things that they can do well, and which make them feel good about that ability. For example, this could be running really fast or able to pick out different types of birds. You can then play a round of ‘I am good at…’, in which kids take turns to chat about these things by finishing the sentence. If you find that one or more children don’t feel they can respond, ask another kid to step in with something they believe that person does well. Then, talk about how learning is a lifelong activity—it’s something we never stop doing and we are always learning new skills. You can use this opportunity to go back over the things they’ve just said, which they didn’t have a few years ago. Share one of your own learning experiences and note any difficulties you encountered, but end with how satisfying it was to finally learn that skill. End with a group round of ‘I can…’, giving the children a chance to re-affirm their beliefs in their strengths. Kids can then break into smaller groups. In these, one child will lie on a piece of paper while the others draw around him or her, creating a body outline. Get the rest of the children to ‘decorate’ this body shape by drawing all the talents and skills they can see in that child. The final touch is that each group member can write a positive statement of encouragement and put it by the body outline. These completed ‘body shapes’ are good to hang around the classroom, so kids can see them every day. Find the I am and I can activity in full form as part of the Northern Ireland Curriculum. Another great self-reliance activity for children of writing age is getting them to schedule their own time. This is a simplified exercise centered on individualism and personal responsibility, two of Emerson’s key foci. Of course, you can flexibly adapt the difficulty and independence level of the timetabling approach to suit a certain young person’s particular needs and their level of development. It’s as simple as asking them to create their own timetable for reaching their weekly, monthly, annual, or long-term goals. Children can use this activity to learn that getting there in the future means organizing now. They can also get affirmation about their achievements by logging when they accomplish a certain task or goal. Subject – Kids can write the theme of their goal, and you can use homework as one idea, or broader life goals as another. Assignment/Responsibility – Another possibility is ‘Change I want to Make’, although this would ideally accompany another category encompassing ‘Steps I can take to make the change’ (Polk Mentoring Alliance, 2008: 18). Completed – Where the child can have a visible reminder of their accomplishments. This is based on the ‘Getting Organized’ activity form, along with the template timetable on page 20 of the PDF. The PDF we just introduced in the last exercise also has some resources for children to create their own personal mission statements. However, we thought it would be nice to provide a template that teenagers and older children might be able to benefit from. Personal Mission Statements also ask a young person to think about who they are, what they represent, what they want to accomplish, and why. They encourage self-reliance by inviting the writer to look inside themselves and seek their own values and beliefs. Outline your perfect day with unlimited resources. Describe as much as you can about your passions and interests. Imagine you’re happily surrounded by your family at the age of 150. What would you tell them about the most important things in life? Pretend it’s a significant milestone at a later stage in life; maybe you’ve turned 30, 50, or 80. The press asks you to summarize your accomplishments and think about what you’d hope your colleagues, peers, and family to say when discussing you. How would you like to have made a difference in their lives? The next part is for the writer to review the answers to these questions. The idea is that these should give them valuable help to answer the questions above. That is, as noted above: who they are, what they represent, what they want to accomplish, and why. This PDF from Humboldt State University is the outline for the exercise in its full form. So how is self-reliance measured? One assessment sometimes used by therapists and teachers is called the Self-Reliance Scale. The Self-Reliance Scale (SRS) is one measure in the Behavior Assessment System for Children (BASC-3) (Sandoval & Echandia, 1994). The BASC-3 itself is a tool for assessing whether school-age children of 3 to 18 years old may require extra support for their emotional and behavioral functioning (Pearson Clinical, 2019). Utilized in both clinical and educational contexts, the BASC is sometimes administered by educators, and sometimes by parents. If you have come across this assessment before, you’ll know that it contains several scales, one of which is used to measure Self-Reliance. Youths taking the BASC-3 usually give a self-report answer on either a Likert scale or they can give a True-False answer. Usually, the forms take only a few minutes to administer in total. You can find the sample report by Pearson Clinical, which was put together by Dr. Kamphaus and the late Dr. Reynolds. Want to know more about Transcendentalism and how it’s linked to self-reliance? The Transcendentalism movement is generally acknowledged as having begun around 1820-1836 in New England. Several key ideas underpin this movement, with one of the original sense that individual purity can be ‘corrupted’ by society; that institutions thus (negatively) impact on how the individual mentally ‘forms’ their perspectives and experience of the world around them (Grusin, 1991; Goodman, 2003). This latter concept may be familiar if you’ve read the work(s) of Immanuel Kant, who famously distinguished between ‘perception’ and ‘intuition’ (Kant, 1949). To be uncorrupted, therefore, Transcendentalism advocates individualism. And this links back to positive psychology in, frankly, quite a beautiful way. Put simply, we can choose to ignore, invalidate, or dismiss the (sometimes negative, some would argue false) information we perceive from society. This gives us the power, academics argue, to transform ourselves, as well as the world in which we live (Díaz & González, 2012). Emerson believed that societal pressures—institutions and others—were responsible for a lot of conformist behavior. In fairly rough terms, his view was that children alone don’t succumb to these pressures. In fact, he describes the “nonchalant boy” as the only kind of self-reliant individual who offers “independent, genuine verdict” (McClelland, 2011). The idea that one can rely on his or her own judgment, choices, and be free from these societal influences is to be self-reliant. As such, according to Transcendentalism and Emerson, it’s better to trust yourself. In some cases, if not most or all cases, to trust yourself over and above what others believe. As well as the original text in audio format, here are some lovely videos that explain the concept and its benefits. This video is a review of Emerson’s original essay in audiobook format, plus some explainers. Please note, there’s a swear word thrown in. Here’s the actual essay itself, which is in the public domain. You can listen to the whole thing in its entirety, which lasts a little over an hour. This is another lovely animation that talks about looking within yourself and reducing your reliance on others. The key takeaways are that awareness is a first step, and that self-reliance can impart a sense of emotional freedom. Brian Johnson makes video podcasts about personal growth books on his channel Philosophers Notes TV. In this clip, he takes five key concepts of self-reliance and discusses them in a pretty nice mini-talk. It’s interesting to see how different people interpret Emerson’s original essay in diverse ways, yet the core principles are pretty clear. It’s hard not to learn all about self-reliance and not find out more about what shaped the person behind the concept. This is a very short 2-minute video that features some quotes from Emerson, along with biographical facts about the man’s life. If videos aren’t your thing, you may appreciate some quotes on self-reliance. Hopefully, there will be something you find useful, inspirational, or help you develop your own self-reliance. Good and bad are but names very readily transferable to that or this; the only right is what is after my constitution, the only wrong what is against it. You have brains in your head. You have feet in your shoes. You can steer yourself in any direction you choose. You’re on your own. And you know what you know. And YOU are the one who’ll decide where to go. Moral autonomy appears when the mind regards as necessary an ideal that is independent of all external pressures. You don’t have to worry about burning bridges if you’re building your own. Tradition: a cage for the free spirit. Foolish faith in authority is the worst enemy of truth. Today we’ve thought about what it means to be self-reliant. As well as having a look at the concept in positive psychology, we’ve touched a bit on how Ralph Waldo Emerson contributed so much to the concept through his work. If you’ve wondered why the idea is so important, hopefully, you’ll find some of what we’ve considered to be of use—the ideas of independent thought and using your own beliefs to guide you. You can develop self-reliance by learning to be yourself, practicing making your own judgments, and holding your own values. As you use these to guide you towards your goals, remember not to underestimate the power of your own intuition. Don’t be afraid to be yourself. Hopefully, some of our exercises have been helpful and guided you towards further reading. It’s a fascinating topic! As always, we’d more than love to hear any of your thoughts or comments. Feel free to share them just below! Baumeister, R. F. (1987). How the self became a problem: A psychological review of historical research. Journal of personality and social psychology, 52(1), 163-176. Díaz, E. C., & González, J. C. S. (2012). The roots of positive psychology. Papeles del psicólogo, 33(3), 172-182. Emerson, E. W. (2013). The Complete Works of Ralph Waldo Emerson (Vol. 11). Read Books Ltd.
Festinger, L. (1959). Some attitudinal consequences of forced decisions. Acta Psychologica, 15, 389-390. Goodman, R. (2003). Transcendentalism. Retrieved from https://plato.stanford.edu/entries/transcendentalism/. Grusin, R. A. (1991). Transcendentalist hermeneutics: institutional authority and the higher criticism of the Bible. Duke University Press. Kant, I. (1949). Critique of practical reason, and other writings in moral philosophy. Kloppers, M. (2019). Steps to Self-Reliance. Retrieved from https://www.mentalhelp.net/blogs/steps-to-self-reliance/. McClelland, M. (2011). Emerson and the voice of the child. PhD Thesis, Washington University in St Louis. Retrieved from https://openscholarship.wustl.edu/cgi/viewcontent.cgi?article=1613&context=etd. NIDirect.gov.uk. (2019). How play helps children's development. Retrieved from https://www.nidirect.gov.uk/articles/how-play-helps-childrens-development. Pearson Clinical. (2019). Identify and manage behavioral and emotional strengths and weaknesses with the BASC™-3. Retrieved from https://www.pearsonclinical.com/education/landing/basc-3.html. Reynolds, C. R. & Kamphaus, R.W. (2015). Behavior Assessment System for Children, Third Edition (BASC™-3) BASC-3 Self-Report of Personality – College Interpretive Summary Report. Retrieved from https://images.pearsonclinical.com/images/assets/basc-3/BASC-3-Sample-Report-College.pdf. Sacks, K. S. (2003). Understanding Emerson: “The American Scholar” and His Struggle for Self-Reliance. Princeton: Princeton University Press. Sandoval, J., & Echandia, A. (1994). Behavior assessment system for children. Journal of School Psychology, 32(4), 419-425. Taylor, J. (2018). Raise Self-Reliant Children. Retrieved from https://www.psychologytoday.com/us/blog/the-power-prime/201809/raise-self-reliant-children. Vygotsky, L. S. (1978). Mind in society: The development of higher psychological processes. Cambridge, Mass. : Harvard University Press. Warburton, G. (2016). Ask More, Tell Less: A Practical Guide for Helping Children Achieve Self-Reliance. Denver, Colorado: Outskirts Press.